Registration is $20 and includes lunch as well as a dash plaque to the first 200. Registration ends at noon. Pre-registration is available. 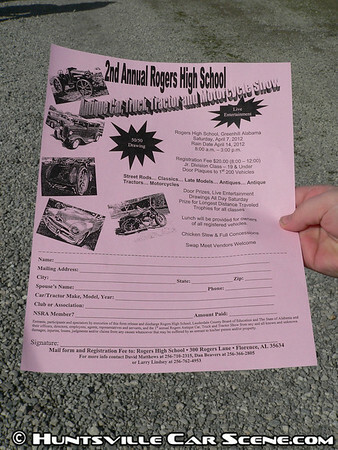 Categories include a Jr. Division Class for those 19 and under, Street Rods, Classics, Late Models, Antiques, and Antique Tractors, Motorcycles, and a prize for Longest Distance. Trophies for all classes. In addition to the show, there will be door prizes, a 50/50 drawing, live entertainment, chicken stew with full concessions, and a swap meet. Swap meet vendors welcome. It says "late model" does that mean all makes and models or does it mean pre-certain year? Wow, that's surprising considering it's a second annual event. I actually heard this was quite big last year.